In the waking hours of March 29, 2011, I received the call that is every parent’s worst nightmare. Before I could utter a sleepy ‘h-e-l-l-o’ my father announced in an odd emotionally neutral tone, “Mindy, Micah’s dead.” “No! He is not!” I shouted with extreme force. “Yes, yes he is. I am looking at him right now,” my father continued. “No! NO HE IS NOT!” I shouted at the top of my lungs. This mother simply could not accept that her only child was gone. For most of us, there exists a primitive fear of the dark and of death. I believe we are here on earth to understand these things and the inherent powers within them. By acknowledging them, we learn how to eliminate our fears and use these powers to experience change and work toward unconditional love. Through the journey of addiction with my son, Micah Aaron Matthew Felcman, I was forced to deal with much darkness and, ultimately, death. But I also learned a great deal about healing: I learned that whatever is lost will be replaced by that which is greater, stronger, and more beneficial to all humans. We truly have a choice to evolve. Once we “get it,” we no longer need for the pain and suffering of addiction or any other illness to be present. More often than not, most of us live in dysfunctional families with unhealthy dynamics and are completely unaware until something serious happens to wake us up. Often we never wake up! Once awakened, frequently we are unwilling to look at ourselves and our role in the unhealthiness. Rather than accepting responsibility for our behaviors we are better at blaming our life situation on others. My message is not about addiction, although it can be, or losing a child, although it can be. It is about stepping through fear to experience change. Embracing change no matter how difficult the situation or challenge may appear. Discovering new ways by changing our perception, becoming an example for others, embodying and reflecting change as a new way of life. It is about reaching a new edge inside ourselves to embrace our deepest fears – those that are buried deep and often hold us back or appear too painful to face. Through the journey with my son, Micah, I learned that change is about meeting wisdom. It is about learning how easy, peaceful, and comfortable our lives can be – no matter what external event occurs. Once we connect with this inner part of our being, our lives change eternally. I share our story in the hope that it will bring light to the increasing heroin epidemic occurring in this country. In the hope that we can unite to bring change to the way we currently understand and view addiction in society. About three weeks after his death, my son began appearing in spirit. I thought I was literally losing my mind. But his continued visits to me and others gave me comfort that I was not just a grief-stricken mother longing for her child. I began keeping notes of his visits to document the profound messages and insights he was sharing from the other side. I had never experienced the power of unconditional love with another human as I did during these sacred visits with my son. It was during these visits that I got to know his true essence. My son asked me to help others by being the voice-piece in the physical realm to share what we missed in healing addiction during his physical life; and to communicate the many messages he shared from the other side. I thought I knew how to step through fear until I felt every cell in my body wince at the thought of telling total strangers about communication with my dead child. I wrestled with this concept for months when finally one day I heard the little voice inside say drop your ego. If telling your story can help one person, the change that results is more far reaching that you can imagine. From that moment, I began writing with purpose. I started speaking to schools, parents, and groups about my journey with Micah. And guess what? People, those total strangers I feared, opened up and shared with me ways their lives were touched that I never dreamed possible. They were impacted by the authenticity and raw truth of our experience which helped them in their own situations. Interviewers encouraged me to keep moving from strength to strength, to share the personal side of the many tragedies that go on all around us, and to break through the wall of denial that is such a part of our lives. I discovered that when I embrace my deepest fears there is no telling the magic that lies on the other side. Mindy Miralia is a pioneer and adventurer, catalyst and change agent. Often referred to as an “edge runner,” she believes strongly in getting in front of opportunities to pave the way for the future. She is passionate about helping people find meaning in life, relieving unnecessary pain and suffering, and holding the space to help individuals make shifts in their lives that bring inner peace and personal transformation. Mindy holds a BS in biology from the University of Houston and an MBA in finance from the University of Colorado. She paved the way for women in international business in the early eighties, opening the first international office for a division of Baker International in Singapore, with geographic responsibility for a network of agents covering the Pacific Rim as far as India and Thailand. She made her first trip to China in 1983. In 1988 she became the first American female executive to work for a British bank in Dubai, United Arab Emirates. There she was responsible for Credit and Marketing for nine countries in the Middle East. She also served on the board of directors of the American Business Council, and frequently lobbied Congress for U.S. business interests abroad. As a volunteer, she taught business mathematics at the local women’s college. Mindy evacuated Dubai shortly after the Iraqi invasion of Kuwait, and eventually relocated to Charlotte, North Carolina in 1992. With her extensive international experience and responsibilities, she quickly became a pivotal player in mergers and acquisitions during the years of financial services consolidations and, in her positions in Charlotte, she played an integral role as the city became the second largest banking center in the nation. Not long after arriving in Charlotte, Mindy’s husband left unexplainably, and at age fifteen, her son became seriously involved in drugs. Mindy later learned her former spouse had early-onset Alzheimer’s. As a single mom who loved her son, she centered her personal life on understanding addiction and addictive illness. She sought out many alternative healing modalities in her quest to help her son. She studied with indigenous peoples worldwide and became a practitioner of energy medicine. 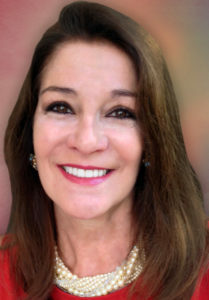 She holds certification from the National Institute for the Clinical Application of Behavioral Medicine in Navigating the Soul’s Journey, is a certified Spiritual Counselor, and is certified in numerous healing systems, including Reiki, Medical Reiki™, ThetaHealing, and Reconnective Healing. Tragically, her son died in 2011 at the age of 31 after a long struggle with heroin addiction. However, because of her lifelong extra sensory and mediumistic abilities, soon after his passing, Mindy and her son began a fascinating and transformational journey of healing together. The details of this healing process appear in her book, The Hero in Heroin (March 2015), and her experiences helped her to develop the consciousness and content of the transformational soul healing work she facilitates today. Mindy is a master at integrating her life experiences, personal and professional, her passion, and her purpose to stand in service for humanity. She continues to pursue the vision of conscious evolutionary development to bring healing to a new level. Check out her book.